Electric cars aren't the only game in electrified vehicles, electric motorcycles are in a period of rapid growth in sales, companies, and capabilities. Electrification is coming not just to cars, but to motorcycles as well. 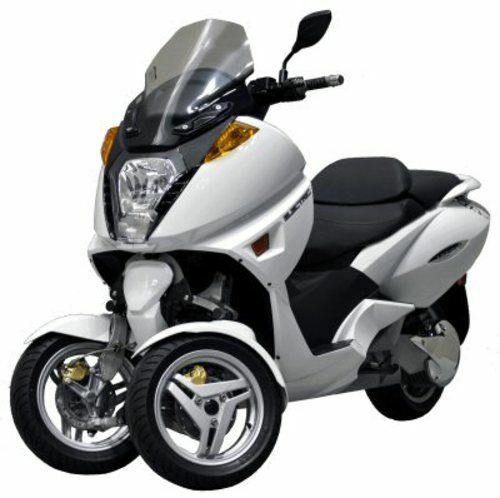 While most of the electric motorcycles are two wheelers that look like traditional motorcycles, some are three wheeled vehicles that look more like a car. Three wheelers are classified as motorcycles even if they have an enclosed passenger cabin. Electric motorcycles often do not have a transmission, unlike regular motorcycles, however Brammo's new bikes are planned to include a 6-speed transmission. Curiously, most of the electric motorcycle companies are based in California (specifically the SF Bay Area) or nearby in Oregon. Brammo: This electric motorcycle company has been selling the Enertia for a couple years now, and in 2012 has promised to finally begin delivering the Empulse street bike, as well as two dirt bike designs. The Empulse is a race tested street bike with over 100 miles/hr top speed and up to 100 miles range. Delivery was originally promised for 2011, but Brammo decided to redesign it to include a 6 speed transmission and delivery is now expected for 2012. Pricing starts at $9,995 for the model with a 60 mile battery pack, up to $13,995 for the model with a 100 mile battery pack. Brammo recently merged with large autosports manufacturer Polaris, with a promise of bring Brammo's electric expertise to Polaris' marketing prowess and size. Zero: The other leading electric motorcycle, Zero Motorcycles, has a full line of five dirt and street bikes they've been selling for several years. Their 2012 model line-up has many improvements over the 2011 line, and the Zero S will be the first electric motorcycle with over 100 mile range sold to the public. The 2012 models should be available in February. Pricing goes from $7,649 from the low end street bike (Zero XU) to over $14,000 for the 100+ mile range street bikes (Zero S and Zero DS). BRD: This new startup has been in stealth mode for a couple years, and recently unveiled itself to show off a trio of dirt-bike style electric motorcycles. The company claims their bikes are faster than the competition but we haven't yet seen them go head-head with Zero. The company is taking pre-orders today and intends to start delivering bikes in late 2012. The base price is $14,995 for an off-road bike, $15,495 for a street-legal version with a 50 mile range and 85 miles/hr top speed, and an $2,495 options package converts the street bike into a police bike. Electric Motorsport: This small Oakland CA based company has been designing and selling electric motorcycles and electric scooters since the late 1990's. They primarily do specialty design work and sell parts, but under the Native Cycles brand name sell a line of electric motorcycles, electric ATV's, and electric scooters. The Native GPR-S electric motorcycle is sold with a base price of $2500 with no electric drive train components, making it the starting point of a DIY electric motorcycle project, and the company can sell you all the parts required to turn it into a complete running motorcycle. Current Motor Company: This Michigan based startup company has developed a line of electric maxi-scooters. The bike can carry two people and has under-seat cargo carrying abilities. The top speed is 60 miles/hr, and there is a performance model with a 75 miles/hr top speed. Range is 40 miles. Base price is $7,500 and its shipped direct to you from Michigan (rather than sold through dealerships). Vectrix VX-1 and VX-3: The Vectrix was the original electric maxi-scooter first launched in 2007, and is generally well-regarded by Vectrix owners. The original Vectrix corporation went out of business in 2009, and the current company bought the assets and rights to continue development of the bike. The current VX-1 has a lithium battery pack, a 68 miles/hr top speed, and a range up to 85 miles. Base price is $11,995 or $13,995 for the longer range version. The VX-3 is a three wheeled version, reminiscent of the Piaggio MP3, and is expected to be sold publicly beginning in 2012. Base price will be $14,996, and it will get 68 miles/hr and an 85 mile range. Lightning Motors: This small startup based in San Carlos CA is working on two fronts at once. On one front Lightning Motors is a leading electric motorcycle racing team holding the world land speed record for electric motorcycles (216 miles/hr) as well fielding the leading motorcycles of the TTXGP North America race series. Lightning's other front is to take all the R&D earned at the race track, and plow it directly into designing and building commercial electric motorcycles and scooters. Currently Lightning is selling electric motorcycles patterned on their 2011 race bike, which they will custom build to your specification, up to and including a replica of their 2011 land speed record setting bike. In the development are electric scooters and street bikes which are planned to be put on sale when the bikes are ready. ZAP Alias: This three wheeled electric vehicle is technically a motorcycle, but has a car-like passenger cabin. The announced specifications are currently a 100 mile range, 85 miles/hr top speed, a 32 kilowatt-hour battery pack, and the electric motor is rated for 60 kilowatts (approx 80 horsepower). Base price is expected to be $38,500 and ZAP Jonway expects to make a limited production run for 4th quarter 2012 delivery. Unfortunately ZAP has a long history of disappointments and delays. Myers Motors NmG and DUO: Myers owns the rights to the three wheel one person enclosed electric motorcycle (which looks like it escaped from Toon Town) originally called the Corbin Sparrow, and is now known as the NmG ("No More Gas"). The DUO is a two passenger version of this concept, while the NmG is single passenger. Myers has been taking deposits for the DUO for a couple years and does not have an announced delivery date, however you can buy NmG's from them today (apparently). Arcimoto SRK: Arcimoto is a startup in Oregon that has been working for several years on their own enclosed three wheel electric motorcycle concept. The Arcimoto SRK has gone through several prototype models, having seen it in person it looks well designed and constructed. Arcimoto is taking deposits, implies they've finished prototyping, but is not promising a delivery date. Honorable Mentions: There are a few names worth mentioning which are not in the business of selling vehicles to the public. The TTXGP (and TT Zero and e-Power) electric motorcycle racing series is entering it's 4th season, and has caused rapid growth of electric motorcycles because of the R&D effect racing has on vehicle technology. Mission Motors was an early high profile electric motorcycle startup company which promised to go into business selling the Tesla Roadster of electric motorcycles, and while they've fielded some impressive bikes in racing events they found more business success developing drive train components to sell to OEM's. Likewise, MotoCzysz is a high profile electric motorcycle racing team, that has fielded impressive bikes in racing, but is getting business success developing drive train components to sell to OEM's. Aptera was an early high profile company developing an ultra-sleek electric three wheeler, but the company went out of business in November. Can you explain why you would list Zap, who deal in the sale of unicorn tears, but not Roehr that has a real electric motorcycle? Uh.. because I forgot about them, which is a bit surprising given that I've covered them extensively elsewhere. One issue is that Roehr never showed to TTXGP races so I never saw them in person. I'll update this report in a bit ... FWIW Roehr's 2011 bike looked better than their 2010 bike. Hub motors are a cheap source of prime mover, usually Chinese-made - high performance bikes that want to keep sprung weight low don't use them.